Twisted Tom was up late to win the Private Terms Stakes in March at Laurel Park. Photo by Jim McCue, Maryland Jockey Club. Already blessed with several contenders on the Triple Crown trail, trainer Todd Pletcher could find himself with another when he sends out late-blooming colt Action Everyday in Saturday’s $125,000 Federico Tesio at Laurel Park. The 36th running of the Tesio for 3-year-olds at 1 1/8 miles is one of five stakes worth $475,000 in purses on the 11-race program. For the second straight year, the Tesio is a ‘Win and You’re In’ event for Triple Crown-nominated horses to the $1.5 million Preakness (G1) May 20 at historic Pimlico Race Course. Also on Saturday’s card are the $125,000 Weber City Miss for 3-year-old fillies, a ‘Win and You’re In’ race for the $250,000 Black-Eyed Susan (G2) May 19 at Pimlico; the $75,000 Primonetta for female sprinters 3 and up on the main track, and the $75,000 Henry S. Clark and $75,000 Dahlia at one mile on Laurel’s world-class turf course. St. Elias Stables’ Action Everyday didn’t debut until late December and won each of his first two races before finishing a well-beaten fourth in the Gotham (G3) March 4 at Aqueduct, his most recent start. “Action Everyday is a horse that has shown some ability and he’s also shown some immaturity,” Pletcher said. “He has been a little bit unprofessional at times in some of his races so we felt like a little more of an incremental step probably made sense for him. Action Everyday rolled by four lengths in his unveiling, a seven-furlong maiden special weight Dec. 23 at Aqueduct, where he returned in an entry-level optional claiming allowance Jan. 27 to win by 1 ¼ lengths despite drifting out in the stretch. “He came into us sort of later in the fall at Palm Beach Downs so it took a little bit of time to get him ready. He’s had a pretty smooth winter and early spring so we decided to ship him up to New York and take a shot at some of those races,” Pletcher said. “He was actually very professional in his debut and then in his second start he made the lead and tried to sort of pull himself up and didn’t quite know what to do with it. Current winter-spring meet-leading jockey Trevor McCarthy will ride Action Everyday from Post 2 at low weight of 116 pounds. Pletcher previously won the Tesio with Smoked Em in 2002. Following an eight-length romp against winners while facing open company for the first time, New York-bred Carradine will look to continue Linda Rice’s outstanding winter-spring meet at Laurel and provide the trainer with her third Tesio win following Kid Cruz (2014) and Talk’s Cheap (1999). Based in New York, Rice leads the Laurel meet in purse earnings ($653,860) and is third with 19 wins while her horses have finished in the top three at an 81 percent clip with 37 starters. D A S L Stable’s Carradine will be racing outside of his home state for the first time in the Tesio. Carradine, who did not meet his $39,000 reserve when offered at Fasig-Tipton’s 2015 Midlantic Eastern Fall Yearling sale at Timonium, ran four times at Aqueduct’s winter inner track meet, finishing third in the Damon Runyon and second in the Gander Stakes, prior to his breakthrough optional claiming allowance win. “We were very pleased with his last race. We were expecting a good race out of him but it was better than we expected,” Rice said. “We were very pleased with the way he drew off in the stretch. He gained a lot of seasoning this winter at Aqueduct with every race. Cornelio Velasquez has the call on Carradine from outside Post 5 at 118 pounds. Also back for another try in the Tesio are Twisted Tom and O Dionysus, who ran 1-2 in the Private Terms March 18 at Laurel. It marked the stakes debut for Cobra Farm, Inc.’s Twisted Tom, who came flying on the far outside to nail favored O Dionysus by a nose in his fifth career start. Laurel-based O Dionysus will be making his 10th start in the Tesio and ninth on his home track, where he owns two wins, four seconds and a third. 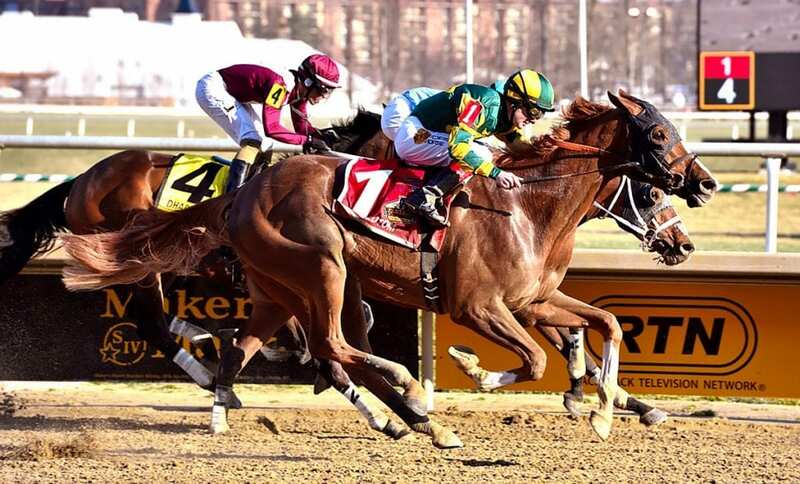 Easy winner of the one-mile Miracle Wood Feb. 18, the Bodemeister colt was also narrowly beaten by Triple Crown contender Irish War Cry in the Marylander Dec. 31 and graded stakes winner No Dozing second time out last fall. O Dionysus was making his two-turn debut in the Private Terms, rating behind horses for a half-mile before edging past stubborn leader Dharmaster in mid-stretch and looking like a winner until getting caught at the wire. O Dionysus drew Post 4 at co-topweight of 122 pounds with regular rider Jevian Toledo. Rounding out the field is Cash is King’s Hashtag Alex, a son of 2008 Preakness and Belmont Stakes (G1) winner Afleet Alex, most recently sixth in the Private Terms. Prior to that race, he was a front-running winner of a one-mile optional claiming allowance Feb. 28 at Parx, where he made his first three career starts.